12,6 sq. km (15 thousand sq. yards) 2-Yurt Lake , 171-m (561 feet) sea level, maximum depth 25,6 m, was formed as a result of glacier recession. The lake is surrounded by the mountains, which make a picturesque panorama of virgin nature. The lake is an ideal spawning-ground for relict sockeye, which come up in mid July. Rainbow trout and char of various colors live in the lake all year round. Some silver salmon come up to the lake in September. 2-Yurt River runs into 2-Yurt lake and flows out of it to join the Kireuvna River and then, the Yelovka River . In 100 km they join the biggest river of the peninsula — The Kamchatka River, which rushes to the Pacific Ocean. 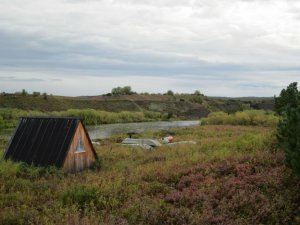 In 300 m (550 yards) from 2-Yurt Lake the river contacts and swiftly flows down into the canyon. Then it goes on its fast flow through a great number of rocks and boulders. 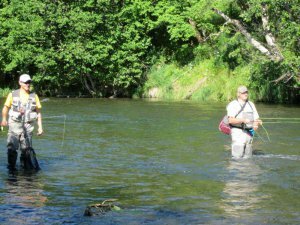 The canyon is a great fishing section with a lot of nice pools teeming with rainbows. The riverbanks are covered with birch, willow, cedar, sorb and alder brush as well as high grass. Below the river canyon the white horn trees, larch, poplar and aspen will appear on the banks. One bank of the river is quite steep, about a meter (3 feet) high. Rainbow trout here are wild, native and surface feeding on mayflies, caddis, salmon flies and stone flies. 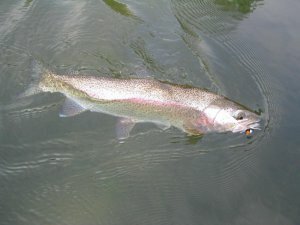 A great number of various bugs' and salmon eggs allow the population of local rainbow to grow. The average sizes of our rainbows are 22 inches; 24 to 26-inch rainbows are common on the 2-Yurt River. You will also catch Char and Grayling. 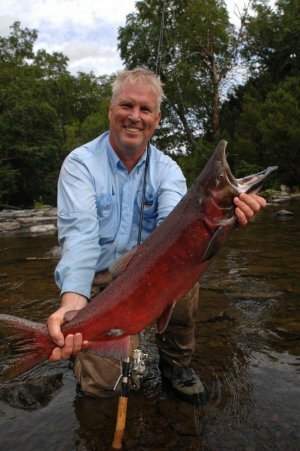 In July and through early August in some sections of the 2-Yurt River you can catch King salmon. There are also some Silver Salmon in September as well. The river is unapproachable for the locals. You will have no competitors there but bears and white shouldered eagles that feed mainly on fish all season round. 2-Yurt Lodge is located in the thermal spring's area 1 km (0,6 miles) from 2-Yurt Lake. 2-3 guests share a comfortable and spacious log cabin with wood stove heating. You will be able to relax and soak in the hot springs after your day.